The Cup ‘O Joy, a concert venue in Green Bay, Wisconsin, is celebrating its 20th anniversary. Offering 103 ‘free will offering’ concerts annually, the only weekend during the year which the Cup takes a holiday is to put on its annual benefit concert. Here, national music acts play to a large crowd for a minimal admittance fee which is used to keep the lights on at the Cup for another year. This landmark anniversary celebration is special since the Cup held its benefit concert this year at Green Bay’s majestic Meyer Theatre. Very special this year with Joy Williams and Shawn McDonald sharing their talents with an audience 800 strong. Shawn McDonald said it best, “Whoever named Joy Williams got it right, and I’ve never met anyone so full of joy!” Joy Williams, a diminutive young lady with a string of pop hits, some of which have recently been aired on “Grey’s Anatomy”, has an honest, truthful and welcoming personality, complimented by a smile that lights a dark world and an angelic voice. While continually giving of herself for nearly a decade this young talent has recently shown a new maturity, sharing her personal growth and a glimpse of what is new in her latest set of three EPs (extended play CDs). Showcasing a few of her new songs, Joy opened with “I Hate It When We Fight” giving each of us in the audience a glimpse into our personal lives. The sparkling “One of Those Days” was followed by, among other jewels, “Hide” which provided testimony of those who desperately try to let go of an entrapped life. Joy’s unmistakable vocals, accompanied on acoustic guitar and backing vocals by Sam Ashworth, provided moments her audience easily related to. The evening’s intermission surprised with a combined set featuring a solo Shawn McDonald performance on guitar and vocals. A film representing the Cup ‘O Joy’s 20 year history was shown, which included a collage of pictures and videos of the period. Joy Williams finished with a solo performance on piano highlighting the collective audience’s passion for the evening’s first half of entertainment and paving the way for the second. Shawn McDonald continued the evening’s entertainment on vocals and guitar with accompaniment by Jeffrey Neimeier on acoustic lead guitar and electric violin. A gifted and intense performer, Shawn’s musical connection with his audience is strong while his personality is laid back and humble. This unique combination shines through in Shawn’s lyrics and melodies. Opening with the dynamic “Roots” Shawn followed with “Shadowlands” powered by heavy lyrics and two powerful acoustic guitars working together so well you could feel a percussion created as the two instruments connected. 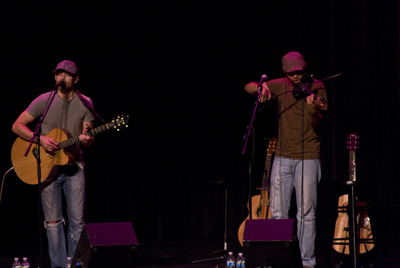 An introduction to Shawn’s much anticipated next offering came with the new song “Sailing On The Sea Of Mystery”, followed by crowd favorites such as the invigorating “Captivated”. Each of Shawn’s offerings give testimony to his song writing prowess showing shades of J. J. Cale’s brilliance. As each song was introduced, served to the audience and accepted with relish, it became obvious this is an artist influenced by his faith and influencing others by sharing a very personal slice of himself. As the evening came to a close friends united, artists welcomed fans and new friends and fans created special memories. We have plenty to be thankful for. Keep up the good work Cup ‘O Joy!